Let me begin by saying: I am not much into cutesy. Crab is everywhere right now: fresh boiled crab legs served simply with butter, crab omelets, and something called "Tabby's Crabby Patty." Please note that the last one is at one of the best restaurants in town. It may be very good, but I can't get past the name. Summer in Alaska is an embarrassment of riches when it comes to fish and shellfish. I won't claim that crab is cheap here, per se, but you can get decent deals on fresh frozen crab legs. It's a luxury item that's brought back down to earth a little, at least for special occasions. David and I were invited to a potluck of sorts at a friend's house on the Fourth of July. Since the Fourth was in the middle of the week, I was feeling anxious about being out of the office, plus I was a little sunburned (not a good look for me--and I'm vigilant with sunscreen!) and generally cranky. I didn't feel like making that much of an effort, to be honest, but I'm too persnickety to take food that I'm less than proud of to a potluck. Enter this luxe-looking spread, which looks more complicated than it is. It takes maybe fifteen minutes to put together, and that's only because you have to shell the crab. I've tweaked the recipe from how it is originally written because the crab/butter ratio was off. Also, learn from my mistake and chop the crab a bit finer than you see here. As an aside, I had a great time at the potluck. Sometimes it's just hard to leave the house to socialize when I'm in a mood, but I'm always good when I get there. Before I get to the recipe, don't forget to comment to win a bottle of very good olive oil, my treat--just go here and leave a comment. I'll randomly choose a comment left by 6 p.m. on Sunday. Boil lemon juice and sherry in a small pan over medium-high heat; it should reduce to just over a tablespoon. Set this aside and allow it to cool. Using a mini-prep food processor, blend the butter with the zest, cooled juice mixture and cayenne pepper until smooth. Add the zest to taste, then transfer the butter mixture to a small bowl and fold in the chopped parsley (if used), salt and pepper to taste. Add a bit more cayenne if you like. 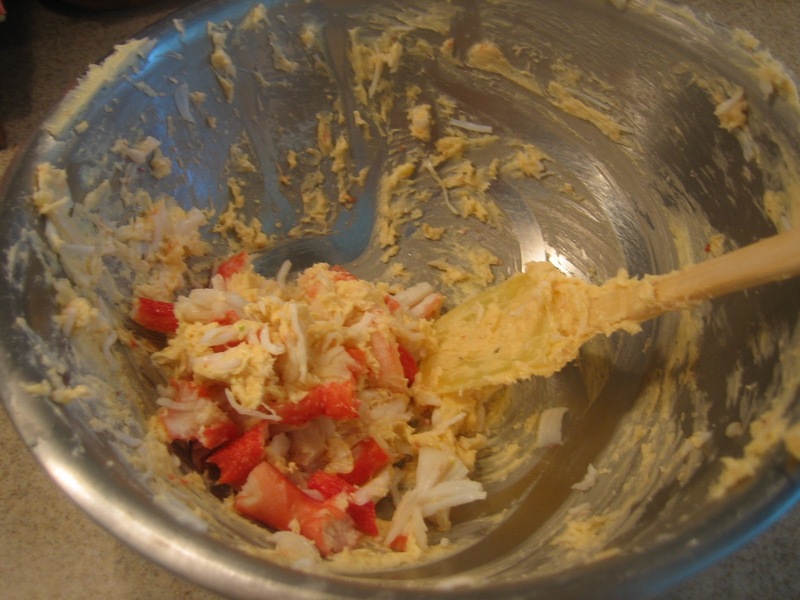 Using a small spatula, fold in the chopped crab. Divide the spread into two ramekins or other serving dishes, then smooth the tops and cover with plastic wrap. Chill for at least an hour; you will then need to bring it up to room temperature to serve. 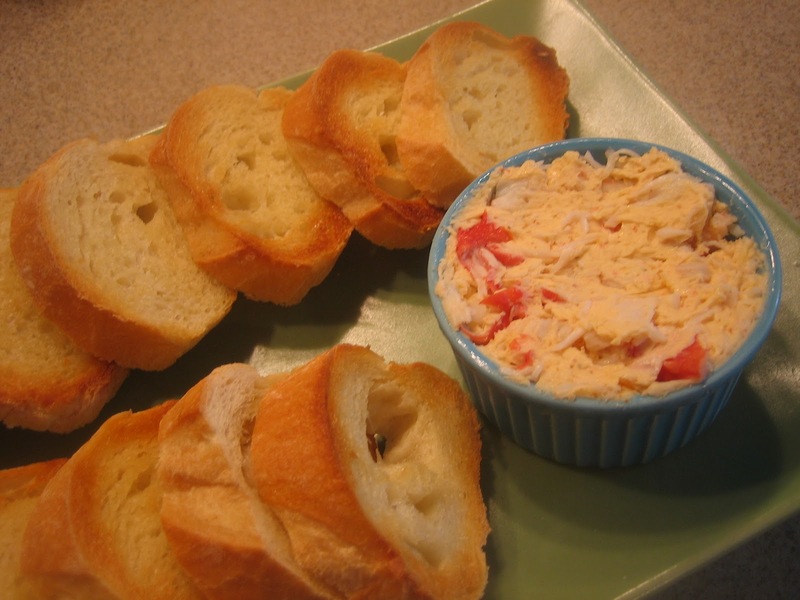 Serve with buttered toasts or your favorite cracker--steer away from strongly flavored crackers to allow the crab flavor to shine. Makes about one and a half cups of spread. Oh man. If only I could eat seafood! Vegetarian life is rough. Recipes like this don't make it any easier! I did post a vegetarian recipe today, for what that's worth...I try to keep a balance. The great thing about it staying light later is that I can go for walks later and not have to worry about it being dark. It does make trying to get to sleep interesting, though...thank goodness for good blinds. I'd eat the entire bowl. I would love all the fresh seafood that summer brings in Alaska. It's my main protein. I wish I could get fresh crab here! This looks divine! Crabs are also not cheap over here and its more of once a while treat for us. I normally go for the fresh ones and again, its only once a while I can find the really fresh ones. Nice and lovely, something new for me. You bet it will have tasted fabulous with the bread slices. So sad to hear about your crab allergy...shellfish allergies are miserable. David is definitely more social than I am, so I'm in the same position. Beautiful spread, take full advantage my friend! I used to love crab legs back when I ate shell fish, this dish looks tasty. I know exactly what you mean about not wanting to go somewhere, just hang about the house but when you do get there it turns out to be quite nice. It is the leaving the house part that gets me. Have a lovely weekend. Exactly--once I get out of the house, it's OK. David calls it "couch glue"--the impulse to stay in and nest. I think it's a ginormous crab cake with some aioli, based on what I saw the last time I was at that restaurant. Who's Tabby? Not a clue. PS: My friend ordered my heritage Bundt pan online from William Sonoma. I can't find soft-shell crabs here, sadly. Thanks for the information on your gorgeous bundt pan! I love adding sherry to crab it really enhances the flavors this soundd amazing! I'm excited about the REAL crab in here..many times I find that people cheat and pretend like patrons can't tell the difference...I will def. be making this!!! There is NO way to hide fake crab in this recipe--the flavor is front and center. Let me know what you think! I don't think this would make it to the table! It sounds so amazing! I LOVE crab anything! 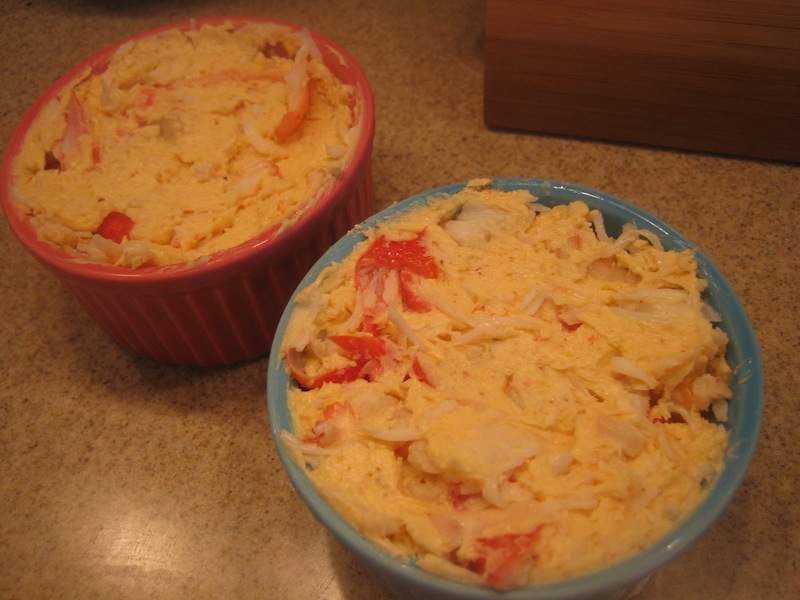 Your crab spread looks great. I always like a recipe that looks like more work than it actually is! And I'm glad you had fun at the pot luck. It's posts like this that make me very sad I am unable to eat crab :( it sounds great. My dad was from the east coast and loved seafood. He would have loved this. I have my unsocial moments too, but when I get there my mood immediately changes and I say to myself that I did the right thing going. This spread is right up my alley. Saved and filled!